Hold on a sec, maybe Ser Davos is the Prince That Was Promised on "Game of Thrones"
With only SEVEN episodes left of Game of Thrones, many of our longstanding questions about the series are finally being answered. And, in turn, some of our favorite fan theories are being debunked and/or confirmed left and right. But with so many new answers, there’s still one we’re waiting for: Who is The Prince That Was Promised (aka TPTWP). While the current frontrunners for the illustrious savior are currently none other than Jon Snow and Daenerys Targaryen, it’s still truly anyone’s guess as to who is the reincarnate of Azor Ahai — except for Stannis. It’s definitely not him. But, in addition to Jon and Dany, countless characters have been theorized as TPTWP, including, Jaime Lannister, Gendry, The Hound, and even the late Rhaegar Targaryen. 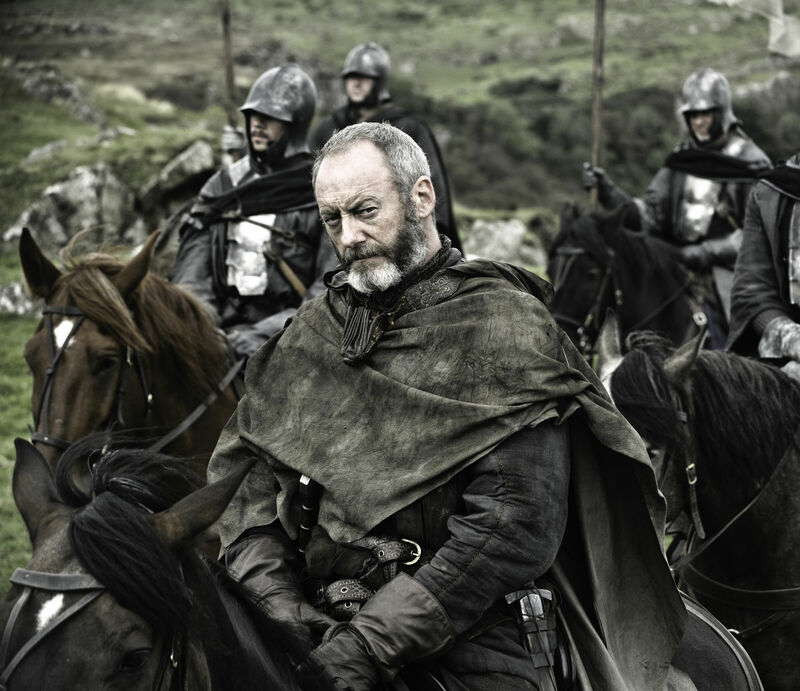 While he’s been long in the mix for TPTWP, there’s another new fan theory that suggests it’s the one and only Ser Davos Seaworth. Reddit user FollowTheBeard recently broke down the argument for Jon Snow’s right hand man, and honestly, it’s definitely compelling to read. He starts where many other fan theories have begin: The flaming sword on the beach. In the Season 2 premiere Stannis Baratheon wields a flaming sword — something Azor Ahai will use to save men from the long darkness — which leads many, including Melisandre, to believe he was the chosen one. After Stannis discards it, Davos picks it up. Additionally, one of the iconic lines from the prophecy is, “Azor Ahai shall be born again amidst smoke and salt…” of which, like many characters on the show, Davos certainly fits the bill. Davos is presumed dead after the Wildfire strike during the Battle of Blackwater but is found alive by the pirate Salladhor Saan, who remarks that Davos has returned to life. Having been nearly killed by fire at sea, Davos’ is certainly a bit changed by the experience, metaphorically reborn amidst the smoke and salt. Sound familiar? But where FollowTheBeard’s theory becomes more compelling is how he fits into the latter part of the above quote from the prophecy, “…to wake dragons from the stone.” Now the redditor believes this refers to the second episode of season six, as Jon’s loyalists discover his dead body at Castle Black. Jon (a secret Targaryen) is laid on a stone table while his friends figure out what to do. Melisandre has lost faith in the Lord of Light before a rousing speech by Davos convinces her to try and revive him. Even after ever the attempt seems to have failed, Davos lingers last, begging Jon to wake up. FollowTheBeard sees this as Davos truly being the one to wake Jon. Since then, Davos has remained Jon’s most trusted advisor and surrogate dad on Game of Thrones. As we’re quickly getting down to the last batch of episodes of Game of Thrones FOREVER, hopefully we’ll learn the true Prince That Was Promised relatively soon. Whether or not it’s actually the Onion Knight, I am a huge fan of this theory.